I'm taking a break from Shrink Rap for a while and leaving the blog to ClinkShrink and Roy. As I mentioned in my post on "A Matter of Perspective," sometimes people come to an impasse where they simply can't hear what the other has to say in the way that it was intended, and on certain topics, I think I've hit that place with a handful of our commenters. I feel unhappy when I try to express myself and my words get twisted and distorted so that meanings and intentions that are attributed to them are far from what I ever meant to convey. I understand that some commenters feel the same way when they try to get me to hear their points of view, and so I believe we are at that impasse of irreconcilable differences. At moments, the comments over the past few weeks have been outright mean. There is a respectful way to disagree-- one that has a chance of getting heard-- but some of this has turned into name-calling. As Rob says, I could use a thicker skin when it comes to blog comments. I have been struggling over the past couple of weeks because I write something, it gets shot back at me as something I never dreamed I was saying, and I've been left to ask myself why I want to write for readers who are so angry with me? If they don't like what I have to say, why do they read my blog? If they have a better ideas, why don't they write their own blogs? 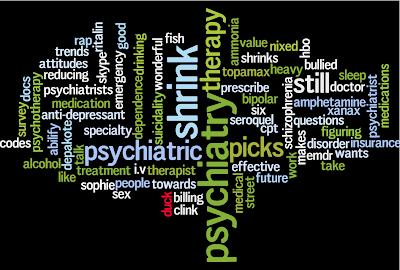 It's as if Shrink Rap has become a magnet for those who've had bad experiences with psychiatry --- and you know, that's always been fine, we've learned a tremendous amount from our readers-- but lately I feel as if we're not just a forum to allow open conversation on the good, the bad, and the ugly about psychiatry-- but that we've become punching bags. This is not why I've decided to take a break, but it started to move me there. I spoke with a friend last night who mentioned she's been following what's happening on Shrink Rap. She wanted to know, "What's wrong with those people?" Other real-life (as opposed to blog life) friends comment that readers won't be happy until I declare that involuntary hospitalization is absolutely the same as Nazi concentration camps without qualification, and I've had other real-life folks contend that I'm catering to the Axis II's (not my words). I love Shrink Rap, but part of it's mission is to explain psychiatry and to de-stigmatize mental illness and it's treatment. What transpires in our comment section has not been successful lately: if anything some (and please, I mean some) comments fan the flames for the worst stereotypes of patients with psychiatric disorders. They do nothing to further the cause. A second mission of Shrink Rap is that it gives me a creative outlet, a place to write, a place to vent, a place for thoughtful discourse about things that are important to me. Lately it is a lot of work to watch my every word and very disheartening to still be misunderstood. Just like my day job, you say? No, much harder. My patients come to get well and they understand that I'm in their corner. None of them analyzes the nuances of every word that comes from my mouth. This is good: I talk a lot and sometimes I say impulsive things. My patients are wonderful people, I love working with them, and this is why I love my work enough to want to write about it in my free time. Many people have commented, or sent me messages and emails, saying they don't understand the hostility and they like Shrink Rap. To all of you: Thank You. I will be back, I just find that it's consuming too much of my thoughts and dampening my mood, so I'm going to step back for a little bit. 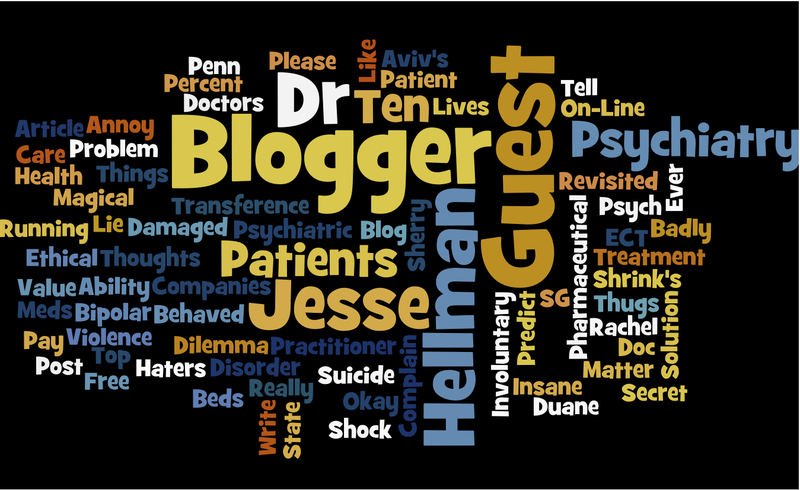 http://psychiatrist-blog.blogspot.com/2011/06/please-complain.html or start your own blog. If you want to tell me that no one will listen to you because you're a psychiatric patient, I don't believe that. Please no comments on this post. There have been some recent reports about the increasing use of atypical antipsychotics on both ends of the age spectrum. The US GAO (Government Accountability Office) issued a report in December finding higher rates of psychotropic use, including antipsychotics, in foster children compared to nonfoster children (3-4 times higher). Recommendations for increased vigilance and monitoring were made. 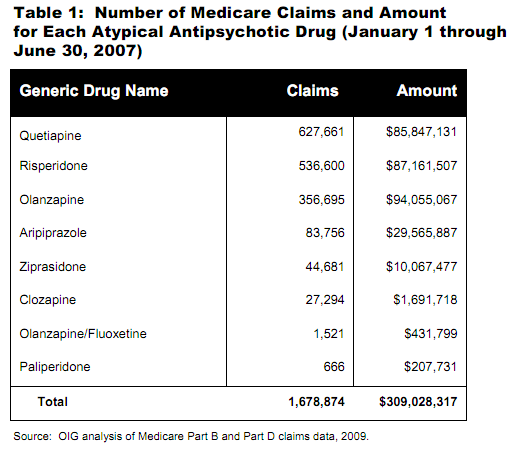 In May 2011, the US OIG (Office of the Inspector General) issued a report entitled, "Medicare Atypical Antipsychotic Drug Claims for Elderly Nursing Home Residents." This report examined claims from a six-month period in 2007, finding that 14% of nursing home residents had at least one claim for an antipsychotic, amounting to over $300 billion. Eighty-three percent of these claims were for off-label conditions (e.g., agitation, insomnia), and 88% were associated with a dementia diagnosis. Atypical antipsychotics carry a warning about using them in elderly patients with dementia due to an increased risk of heart attack and stroke. So, there was a hearing in November before the Senate Special Committee on Aging about this issue. The hearing itself can be viewed on their website, as well as links to the testimony provided. This is an important issue, because as our population ages and develops more dementia, the pressure to manage the resulting behavioral problems with pills rather than with patience, understanding, and adaptation. Medications can have a role, but cannot be the only solution and should not be used excessively. Some quotes follow. Patients with dementia often have trouble comprehending their environment, resulting in misperceptions that are often perceived as threats. In most instances, the key to behavior management in dementia is environmental modification, especially the human environment, which may be as simple as changing our approach and our response in order to prevent and minimize distress. The fundamental basis of health care is caring for others. The fundamental basis of caring is love, acceptance, and respect for persons. Medications are used often as the first intervention because family members, care givers, nurses and doctors in ALL settings lack information or training regarding alternatives. To merely target this one class of drug as the “problem to be fixed” will have the unintended consequence of increasing the use of other, equally risky medications, such as benzodiazepines, anti‐seizure medications and sedative‐hypnotics, all of which have side effects that include confusion, falls, and risk of death. Furthermore, if the focus is only on the nursing home, we will create barriers to access for care that patients and families desperately need. In some states, such as California where consent rules regarding the use of any psychoactive medications in nursing homes are in place, some nursing homes have declined admissions because of a “history of behavior problems requiring psych meds”, creating real challenges for caregivers and often requiring patients to stay for long periods in the acute care hospital. The solution to this challenge is not a short‐term fix, but rather a two‐fold strategy that involves systemic application of non‐pharmacological behavioral interventions as the first line of treatment, with close monitoring for appropriate and limited use of medications when the non‐pharmacological approaches have not worked. Often, when two people can't get along, it seems like the issue is one of communication. People say things that are ill-phrased, or the person hearing a statement assumes an intention that is not meant to be. Sometimes, a well-worded conversation fixes the problem, often with words such as, "I'm sorry that upset you. I never meant it to come off that way and I meant to say X." A misunderstanding, it happens all the time. I sometimes suggest that people read the book Difficult Conversations by members of the Harvard Negotiation Project. The book talks about the value of feeling heard, and how it is important to understand the intentions of the other party. You can't imagine how often I hear stories about people that sound a little off, and when I ask why someone would say or do those things, I hear theories of how the other party is jealous, or just enjoys watching my patient suffer, or is manipulative, or sometimes the stories have quite complex theories dating back to an event that occurred long ago and doesn't seem that memorable. Now the theories could be right, people are jealous, or manipulative, or sadistic, but often I can think of alternative explanations that would explain the same story, and I do think that it may be valuable to ask someone their intentions when things go wrong. Sometimes, people hit a place where nothing can be said that is right by either party. There are irreconcilable differences. One person may talk of their heart-wrenching distress and weep their story, while the other hears it as "there he goes again trying to get my attention with his tears," and the crying party feels like their honest and sincere attempts are useless on someone with a hard heart. You can find your own variations on this theme, I'm sure. I've started to wonder if I have perhaps come to this place with our Shrink Rap commenters. I feel like I say something and the response indicates that my comments were misinterpreted. I try to clarify, it just gets worse, and our comment streams now end with readers insulting the blog, me (apparently I'm someone's nightmare shrink and jail would be preferable--which leads me to wonder why such a person would read our blog), and my choice of topics to discuss. If I talk about an observation I've made, people get angry because of a scenario they've extrapolated that to, which was never what I meant in the first place. Attempts to clarify seem to be futile. I don't feel heard, and clearly, some of the commenters don't either. And sometimes I feel like readers don't want a discussion at all. A story is written in, and I often sympathize with the story because our readers write in about very touching, and often tragic, difficulties. They also sometimes seem to feel that it is the Shrink Rappers' obligation, job, or destiny to right the wrongs they see in psychiatric practice and I do believe we've let these readers down. Sometimes, I feel terribly bad for the person who has been victimized, but I'm also aware that I've heard only one side of the story, and I may talk about what the other side might be. And while I don't believe people should suffer, I do sometimes feel that it's helpful to see other perspectives. It enables a search for a solution to occur with a more thoughtful dialogue. But it also means that I sometimes sound unsympathetic in that my answers are read as "Yes, but..." From my point of view, that's part of the discussion, and if you want to say something and want us to respond with absolute sympathy, having heard half of a story that often demonizes our profession, and you don't want to know how the other side might look at it, then I don't think Shrink Rap is the place to come. 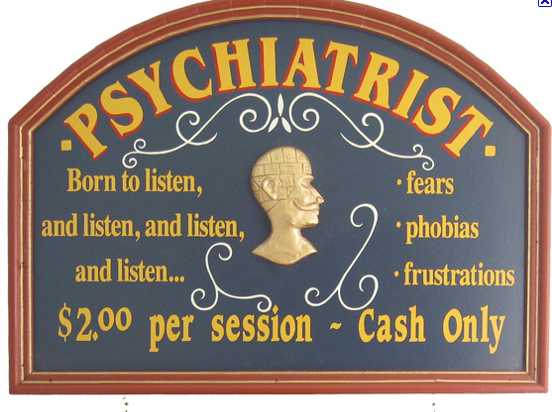 I am not likely to write a post about how psychiatrists are all evil and manipulative control freaks who want only to incarcerate, abuse, and poison their patients. And it's not that I don't believe there may be evil shrinks out there, or stories of abuse, or nasty and disrespectful nurses, and I certainly do believe there are psychiatrists who practice quick, uncaring psychiatry for the sake of a bigger paycheck, but sometimes I want to consider other possible explanations. Let me give an example from recent posts. I put up an article from USA Today on how involuntary commitment is so unpleasant and that if it were more humane, it might not be so awful. I put it up because I agree with it. People wrote in to talk about the abuses they've suffered, and that is fine, it's what I expected. But several people complained about being searched, and how it was offensive and insulting and given their past histories and diagnosis, this was inappropriate. I understand their pain and humiliation, but what doesn't get mentioned is the perspective of others when things go wrong. The patients are new to the unit, the staff has no idea who is dangerous and who is not, and psych units can be very unpredictable places. Some of the policies are made as reactions to bad things that have happened, and often patients have assaulted other patients, or the staff, and suicide attempts (and completions) are not that uncommon. A patient might be insulted at being searched, but is he also insulted when searching is not done and he's stabbed by another patient who came in with a knife taped to his leg? Wouldn't that lead to the same "unbelievable" cry? 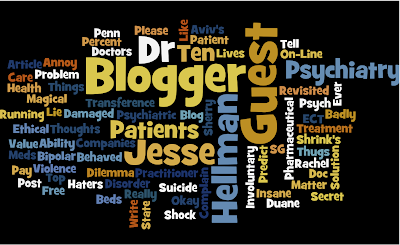 And to read our blog, one would think that no psychiatric patient might ever care about the safety of the hospital staff or their right to be concerned about it. It's not that I don't empathize with commenters' suffering, it's that I'd rather there was just a token nod to why it may be necessary. Why does a four-year-old have to remove and x-ray her flip-flops to get on a plane. Do we really think she's going to blow it up? No, but perhaps we think that if they stopped x-raying children's flip-flops, then a terrorist might then use them as a vehicle for a bomb. Or maybe it's all ridiculous and we should be a little bit more thoughtful about our security procedures. One commenter was distressed about being strip-searched and made the statement that other hospitals don't all do this. Not my field of expertise, but it does seem to me that if one can say "I understand why it's done, I want you to understand how damaging it is," and then go on to say that other institutions don't do this and propose other, less damaging means of addressing the same issue (?metal detectors, drug dogs, pat downs, body scanners, whatever) perhaps there is some power to this. Maybe you get people looking and they say Wow, the institutions that don't strip search patients actually have a lower violence rate (I don't know this, but we do think it's possible that there would be less violence if patients aren't enraged). But someone is going to read my comments about staff and patients being in danger as meaning that I think it's fine to violently rip people's clothes off them, and for the record, I don't. Another commenter asked if I do this to my patients, this 'yes, but' thing. Sometimes I do. If a patient is telling me a story about an interaction with another person that sounds unlikely to me, I may ask the patient why he thinks he got the reaction he did. Would it be honest to sit there and listen to something that doesn't sound right without challenging someone to think about it in new ways, or to propose some other possible explanations? Let me give an example from a recent Shrink Rap topic. If a man talks about how his adult son has estranged him and he has no idea why and he presents theories that sound unlikely (my son wants to control me, he's jealous, he always favored his mama, you name it), and I have a sense of what might be part of the issue from other things he's told me, I might ask, "Do you think the fact that you don't approve of his wife and the way that they are raising their children might be making him uncomfortable?" Or I might ask if the son may have found it difficult to get his approval when he was younger, or if how the father used to treat him before he stopped drinking might be a part of this. But it a patient doesn't want to hear this, if they need me to be all in their court, and if they insist I'm wrong (and after all, I wasn't there, so my theories may well be inferior theories), I back off. The truth is that no matter how troublesome the patient's behavior is or has been, they are my patient, they are the one I am obliged to help, and sometimes I feel around for the best way to do this. No, I don't always get it right. I don't know if this helps, but I suspect it will inflame things. Commenters may say I'm getting defensive again, and they'd be right. I read some of the comments and think, "You'd say this in my living room?" Because if you're someone who might behave in this manner, there is no way you'd be invited in to my living room. I thought I would let you know that Sam checked yes on the box that asked if he had a psychiatric disorder. I thought I would also let you know that Sam was chosen for the competitive internship. If you became psychiatrically ill again and presented an imminent danger to yourself or others, would you want to be involuntarily hospitalized again? Over on Shrink Rap News, a post will be going up about my random thoughts about adult children who essentially divorce their parents. In the families I'm talking about (and I know many), these aren't extreme situations--the children did not suffer from abuse, neglect, or deprivation at the hands of their parents. When they were children, the parents tried to be attentive, caring, and to provide for them as best as they could (which was sometimes rather well). The parents likely made mistakes, because parents are not perfect, but the issues are current ones...and often ones the parents themselves can't articulate. In these cases, the adult children have severed ties even though the relationship was close, and they themselves might say they had good childhoods. Why the estrangement? I suppose it's different in each case, and often there are issues with parental divorce, the relationship with the child's spouse, a sense that the parent is too critical, too judgmental, or perhaps too intrusive and controlling. The adult children may feel they are being used or manipulated. I talk about some of my theories, and they may well all be wrong. None of it science, just what I've gathered from listening. If you'd like to read my thoughts, I invite you to surf over to CPN's Shrink Rap News. And, of course, I'd like to hear your story. You can check over there sometime around noon. 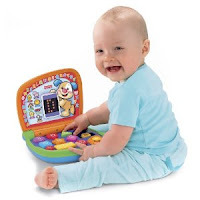 If you're interested, I'll also direct you to a website run by someone dear to me: MOTHERRR! -- about rebuilding mother-daughter relationships. While my post talks about estrangement from the vantage point of the parents, this site looks as mother-daughter difficulties from the perspective of the adult child. 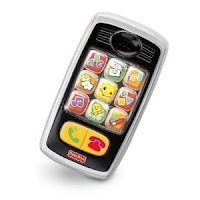 Last week, I posted lists of the Top 25 popular posts of 2011 and also of All Time, in addition to a list of the most interesting/funny/bizarre search phrases on Shrink Rap for 2011. This is my last "Top 10" list from the year of 2011. I sorted the entire list of 257 posts from 2011 by the number of comments received, the highest being 119 comments during the Sherry/Lindeman epoch [winking at Duane and Rob]. Enjoy. I'm still dwelling on these discussions we've had about the inpatient experience. A number of readers commented that they weren't like other patients on the ward who weren't educated, who used drugs and were in and out of jail. I took that a little personally since those "other" inpatients are my correctional patients. I like working with them and I don't like it when people dismiss them as being "just criminals." I also found it a bit ironic that the people who are quick to claim peer kinship with staff are also quick to disclaim equality with forensic patients. You really can't have it both ways. My offender patients deserve to be taken seriously, treated with respect and given humane care whether you want them in your community or not. I don't like the idea of framing treatment in terms of who is more 'deserving' of care. I don't think you can put a rating scale on suffering or prioritize trauma. Nevertheless, when it comes to the spectrum and amount of services that are needed my forensic patients are right up there. They may not be very literate, they've got poor social supports as well as mental health and addiction problems. Oh, and chronic medical problems that go untreated because they have no insurance. They're facing an uphill battle just to reach a "normal" place in society. For my patients, success means having a place to live, a job, people who care about them, maybe even a car and a girlfriend. That's a lot to have when you're starting at zero. Yet when it comes to apportioning services and access to treatment these are the first folks to get cut. Some inpatient units do have patients of privilege---people who aren't starting at zero---and these patients really do seem rich (figuratively and literally) in comparison. But forensic patients are increasingly part of our mental health care system. When we talk about making the system better they have to be part of that discussion. Smith concludes that it's not the world we live in, and that it's perhaps dangerous to make that assumption. He notes, " If you start to believe that anxiety is a foregone conclusion — if you start to believe the hype about the times we live in — then you risk surrendering the battle before it’s begun." What do you think? Are we more anxious than we used to be? And why is that? Is it the world we live in--now or in 1948? Or is it just our own personal psyches? Note, the graphic above is from a book by Andrea Tome. If you missed our interview on Midday with Dan Rodricks, you can still listen by clicking on the Download link, or clicking on the My Three Shrinks icon to the left will open up a browser player in a new window. What is psychotherapy, how does it work? What is psychoanalysis, and why don't all shrinks practice it? Our guest this hour three Baltimore psychiatrists -- answer questions about how they work with patients. Our guests: Dr. Steven Daviss, chairman of psychiatry at Baltimore Washington Medical Center; Dr. Dinah Miller, in private practice; and Dr. Annette Hanson, a forensic psychiatrist with appointments at the University of Maryland and Johns Hopkins Hospital. 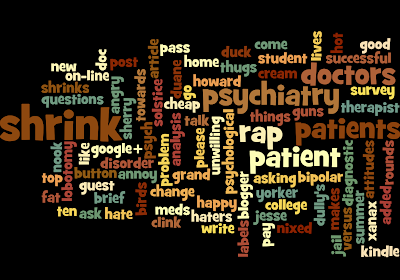 They write a blog together and are authors of “Shrink Rap: Three Psychiatrists Explain Their Work,” published by Johns Hopkins University Press. Midday producer Michael Himowitz says of the book: "This is a remarkable book. 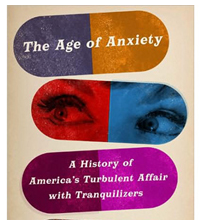 I was prepared to endure it, but it turned out to be well-written without being glib pop-psychology, informative without being overly laden with jargon, and surprisingly candid about psychiatry’s failings and problems. They should have named it Shrink 101, because it really covers the basics about navigating the disorganized and confusing world of mental health care." Ah, we're back to an old topic, involuntary hospitalization. Some people say they'd rather die than live through a week in a hospital again. I actually have not ever heard anyone say that about jail. I thought I'd ask if everyone feels that way. If you are very much against the idea, but have not been involuntarily hospitalized yourself, please-please-please, don't take my poll. Thank you and Go Ravens! OK, I've gone back through the comments on my last post as well as on Dinah's forced treatment post. I think I've come up with a list of what people have identified as things that need to be added, improved or changed. I'm going to talk to myself in this post, thinking out loud a bit about what each item means to me and how to implement them. Feel free to follow along, add, edit or just ignore me. Like I said, I'm thinking out loud in public. This item is closely related to item #1. If this item were fixed then item #1 might not exist. What most people may not know is that medical schools recognize this is an issue and now incorporate assessment of professionalism into every medical student and resident evaluation. National professional organizations are also thinking about ways of building this into ongoing licensure processes by requiring physicians to solicit evalutations from their patients. There are also now loads of online 'rate-your-doctor' sites. This is just for physicians, though. I'm not sure how to go about evaluating professionalism for hospital security staff who put someone into seclusion. The psych aides or techs would likely fall into the nursing department realm, and there's no reason there couldn't be a patient feedback loop for that profession as well. Ah, this is the tricky one. Some commenters said they wished their doctor would have told them that the doctor felt horribly about having to commit someone. Well, when a patient is in crisis it's really not the time to focus on the doctor's feelings. The point is well taken though that mental health providers should be able to talk to the patient afterward about the experience of involuntary treatment, what it was like (for both parties) and ways to avoid it in the future. See item #4. I've seen some nursing admission forms that routinely ask patients on admission what they do when they are feeling angry or upset, and what helps them feel better in times of crisis. This almost never involves social connections though, which commenters here say they want more of. This is related to #11, the ongoing discharge plan. Who is in your social support system? Are they helpful are hurtful? Who can you reach most easily? Have you actually used this support system in the past or are you b.s.-ing to get out of the hospital (honesty is going to have to cut both ways, now!)? Hospital lengths of stay are so short now there is almost no purpose to a trial pass or day pass. The general thinking is that if you're well enough for a day pass you must be well enough for discharge. The generic 'return to emergency room' is far from an ideal crisis plan. Perhaps some temporary ongoing outpatient relationship, similar to what internal medicine does: discharge from hospital, to be seen in inpatient doc's own outpatient clinic within X days, until more permanent or preferred outpatient care is arranged. Oy, I am the Shrink Rapper with zero food skills. Either of my co-bloggers will confirm that. Nevertheless, it seems evident that medically appropriate, religious or personal preference diets should be available. This one just doesn't seem that complicated, but I don't question that it's a problem. Ditto #5. This is one item where patient satisfaction surveys actually could be useful. If month-by-month discharge surveys are all saying you've got bugs in your bathroom, you've got a problem. Pharmacotherapy is always a balancing act between the level of symptoms a patient can live with versus the burden of side effects that they have to carry. I would throw in this thought as well: the people in your support system have to live with your symptoms, too, so they should also be considered. Can we engage family and friends in this balance? If so, how? I get this, totally. It's tough when you have an inpatient unit that contains both patients who are so ill they need help bathing and dressing as well as multiply-graduate degreed professionals. William Styron once called occupational therapy 'organized infantilism.' These individualized treatment plans that every team has to fill out should be made useful in some way, and this is where this item should be addressed. What meaningful activities would an educated, high-functioning professional want to do (or feel up to) doing? Most of the units I've worked on have not served many of this kind of patient so I'm open to suggestions here. You also have to address the question: if you're well enough to do (high functioning activity X), do you really need to be in the hospital? That's the question insurance companies will be asking your doctor. People want things to do besides (or in addition to) taking medication. I'm guessing this means things like emphasizing regular activity or exercise, proper diet, decent sleep but also activities like yoga or tai chi, bibliotherapy (journal keeping, poetry or other writing), music therapy, and so forth. I've already covered this a bit, but this would refer to the feeling that people are just dropped outside the door of the unit after discharge with no further contact with the inpatient team. There are already some programs available like day hospitals or partial hospitalization programs, but I don't think this is what people are asking for. I'm thinking more along the lines of returning to the inpatient unit for an "outpatient" visit, if that makes sense, while making the transition to a traditional outpatient practice. This is the last and toughest point. How do you humanely take someone's clothes away while putting them in physical restraints on continuous observation? I know, some people will say this should never be done but that's just not the world I live in. Some people are dangerous when they get sick. Psychiatrists have to make sure everyone in the unit is safe, in addition to protecting the patient. Making sure everyone is trained to recognize and intervene early is important, to prevent seclusion and restraint. Working with the patient early on to identify coping skills and practice those skills, and make sure people on the unit are trained in verbal de-escalation techniques. This won't obviate the need for seclusion in all situations, but it should help minimize its use. OK, I've spent a fair amount of time thinking about this post, reading old comments, writing and speculating and I'm running out of steam. More later. The last three or four items are going to be the longest, I think. Dinah and Roy, feel free to jump in with your thoughts. This is the stuff of inpatient interviews. We joined will be joining Dan Rodericks on WYPR, 88.1 FM on Monday from 1 to 2 pm. You can listen to it or download from WYPR. If you're local, please listen. If you're not, live streaming information is on the WYPR website at http://www.wypr.org/listen-live. We'll put up a link after the show, and information to call in or email is shown below. Midday is WYPR's daily public affairs program heard from noon-2pm, Monday-Friday. Hosted by longtime Baltimore Sun columnist Dan Rodricks, the program covers a wide-range of issues selected to engage, inform, and entertain the listening audience. Topics range from the latest news, to local and national politics, to social, medical and cultural trends, featuring the best new books and most engaging authors, newsmakers and guests. Dan has won numerous regional and national journalism awards, and he has frequently been cited as Baltimore's favorite columnist by Baltimore magazine and the City Paper. Previously, Dan was a commentator on WBAL-TV, host of a talk show on WBAL-AM, host of documentaries on Maryland Public Television and, from 1995 to 2000, host of the popular Rodricks For Breakfast show on WMAR-TV. He is the author of two books about Baltimore and lives in the city. Rob wanted to know if I was reading the comments on Dinah's post about involuntary treatment. He thinks that psychiatrists may read these comments, shrug and say, "Well, sometimes it's necessary." I did read the post, and the comments. I can tell you that the decision to involuntarily admit or treat someone is never a "shrugging" issue. This is something psychiatrists hate to do. I mean, literally hate. We know it's something that can destroy a therapeutic relationship and undermine someone's willingness to seek care in the future. We know that psychiatric units can be horrible places to be and that admission is expensive, humiliating and sometimes traumatic. The decision to seek involuntary treatment is not done lightly or easily. You and some others may feel it should never be done, but I think that's an issue that may never get resolved between us. Maybe someday medicine may develop better ways to diagnose and treat mental illness, or society may evolve and decide that psychiatric patients are worthy of the time and money spent on other suffering people but we're not there yet. We deal with the present, as it stands, with what we've got. Remember that there are comments that you don't read here. The missing comments. The comments that can't be posted because the suffering people are dead. On behalf of those folks, and the people who care about them, I'm sorry. I'm sorry that psychiatry as a profession and the mental health system failed you. I'm sorry that you had to hide your suffering from your friends and family, or maybe from your doctor, because you thought you had no choice. Clearly, something needs to change. This is why Dinah posted about the issue and why I'm following up. As a group, we need to figure out better ways of doing things. The Shrink Rappers don't have the answer. We need to hear concrete ideas and suggests. General comments like, "Stop treating me like a child" or "Don't be a jerk" honestly aren't helpful. The commenter who suggested that patients should be allowed to have cell phones on the unit, to call friends or family when in crisis on the unit, now that's the kind of idea we psychiatrists need to hear. The discussion about post-discharge aftercare and the continuity gap is crucial. Please tell us more about that and about what kind of services or support would have been useful and what we need more of. I like the idea that this could also help catch people in early relapse. We need to answer the questions about these services: what, when, where, who and how. On Sunday, I published the Top 25 posts from 2011. Today's TOP list is of the Top 25 posts of all time (well, since we started, in 2006), starting with our all-time fav, the Xanax post. Enjoy. Coming up later this week... Most Interesting Search Phrases from 2011. These are often very funny, interesting, or just plain bizarre. Here's the list from 2008 to whet your appetite. Go for it, I know we have many readers who oppose forced treatment. Studies have shown that what works is not force but access to effective services. We don't need to change the laws to make it easier to lock people up; existing laws provide for that when warranted. Instead, we need to create and fund effective community-based mental health services that would make it attractive for people to come in and receive care, and that would support them in their recovery. I don't know if better access to good care is the whole answer, but it's not a bad place to start. Roy wants to remind APA members to VOTE! in the APA elections. Roy talks about our Top 25 Posts for 2011. ClinkShrink talks about copyright issues with the Mini-Mental Status Exam (MMSE). We talk about what the MMSE is, what it measures, and why some folks are bothered by the copyright issues. Roy mentions an alternative, the MoCa, which may be used clinically without any permission needed. Roy mentions his Clinical Psychiatry News article in the Shrink Rap News column discussing the October SAMSHA meeting on electronic health records in behavioral health. He talks about continuity of care documents (CCD) and XML (Clink and Roy have now lost me in Geek Speak), which gives the outline about what was important about that 'episode of care,' or doctor's appointment, and the 17 categories of things that are documented. This was a stakeholder meeting to come to a consensus about which behavioral health elements should be included in the CCD. Roy talks about something called Granular Consent. 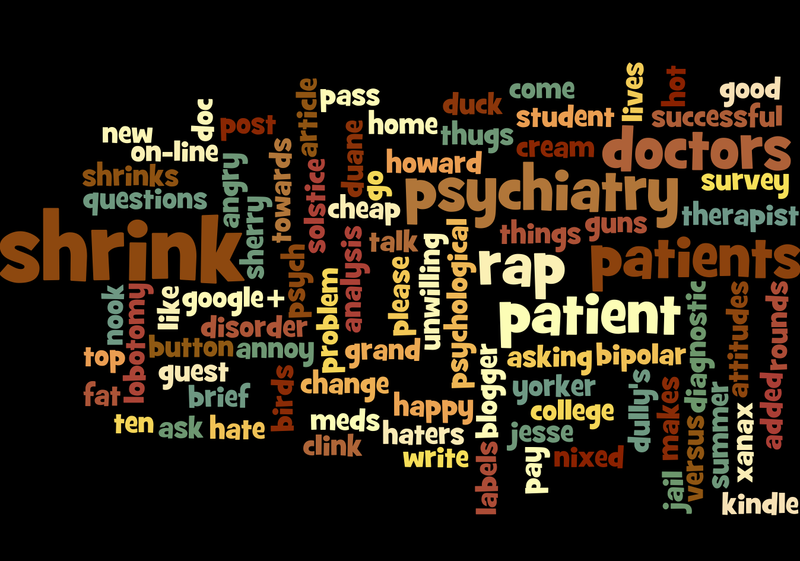 Time for a round-up of the most popular Shrink Rap posts from 2011. These are all posts written in 2011; later I will put up a list of top posts of all time (since we started in 2006), in addition to the -- and this is my favorite -- most interesting search phrases used in 2011. These are listed with the most popular (i.e., most pageviews) post at the top. Please feel free to repost this on your blog or your favorite social media dooblie doo. Ooooh, let me tell you: I love vacation. I really love vacation. I'm back. It's cold here, and I spent the day unpacking and doing laundry, and getting ready to start my week. I returned calls, went in to the office and checked my mail, emailed, postal mailed, and watched the Ducks win the Rose Bowl. Sad, because even though we Shrink Rappers like ducks, I have my own personal Badger out in Pasadena cheering for Wisconsin, and it's a sad football day for him, I'm sure. Roy did a great job of holding down the blog. Please give him a hand. Clink was off on another one of her adventures. For some reason, vacation is not fun for her if there isn't the possibility that she'll fall thousands of feet, get eaten by some form of wildlife, or have her life depend on properly functioning equipment while she gurgles beneath the sea. She's the only person I know where "I had a fantastic time" is followed by an injury report. It was a glorious night for ringing in a new year. Temperatures, unusually inviting for a New Year's Eve in Harford County, hovered around 43. Wind was non-existent. And many people had gathered around the Havre de Grace Middle School grounds for the annual Duck Drop and fireworks to welcome another new year. In other stories around the web, if you're a distracted duck, you might have notice that it's hard to find Ritalin or Adderall-- perhaps another example of DEA limits allowing Big Pharma to be being overly ducky about reducing supply of the cheaper, generic medications. From the The New York Times, do check out "A.D.H.D. Drug Shortage Has Patients Scrambling." And if you're a duck contemplating filing for Social Security Disability, do read Dr. Steve's post on Thought Broadcast about The Curious Psychology of "Disability." With 41 comments on that post, I'm going to swim away from the temptation to comment myself. And finally, for those ducks who want to know the latest on Electronic Medical Records, check out Shrink Rap News over on CPN for "Notes from SAMHSA's EHR Summit." If that doesn't make you want to be served up with orange sauce, then nothing will. So I love vacation, but I did miss all the Shrink Rappin.' Happy New Year to everyone! From Clink: I don't have a duck in this race, so I thought folks might enjoy a seahorse instead. 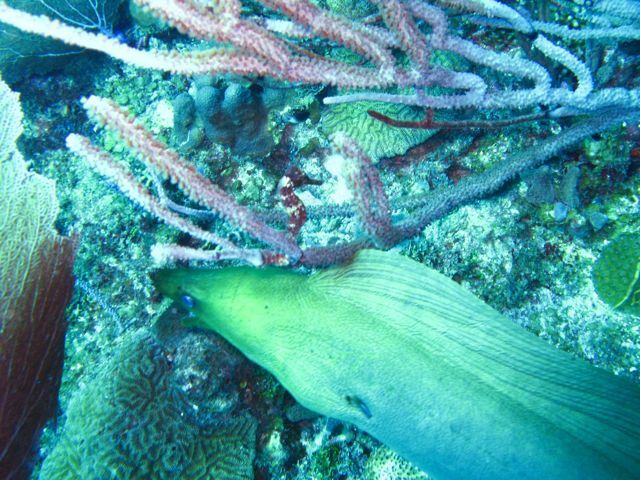 He's black with white stripes and seems to be perched on top of the green moray eel's head. Yes, the eel was that close. No significant injuries this time. A slight jellyfish sting and lots of no-see-'ums, that's it.